Preserved specimen of Latimeria chalumnae, from Smithsonian’s National Museum of Natural History. Researchers are (left to right) Lynne Parenti, Curator of Fishes, Harry Grier, Research Associate, Susan Jewett, former Collection Manager and Jeffrey Clayton, Museum Specialist. Photograph by Sandra J. Raredon. In the book, the Fouling was thought to be extinct. Of course, there are many animals once thought to be exctinct that we now know are very much alive. One of the most notorious living dinosaurs, as some people call it, is the coelacanth. 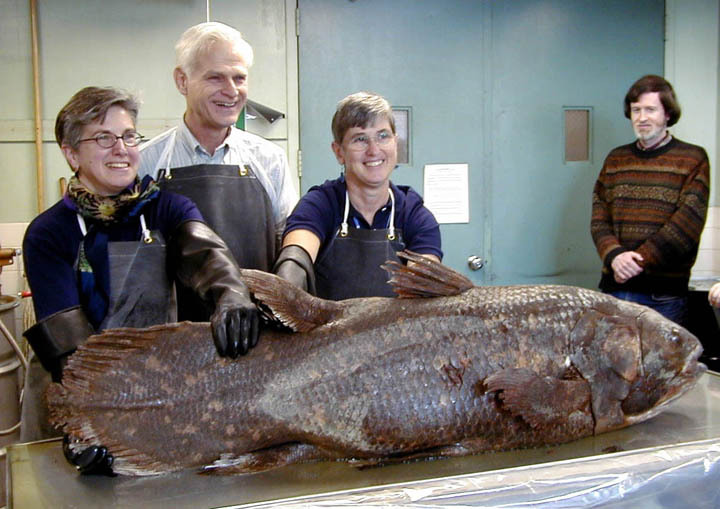 We don’t want to reinvent the wheel–life on expedition is busy enough–so we’re just going to refer you on over to a great page on the Coelacanth from the Smithsonian. Or, if you want even more info on the history of discovery and all that good stuff, check out NOVA’s page.